"You can't say it's careless science ... it's one mistake," says Pachauri, referring to the use of the WWF "grey" reference (i.e., not peer-reviewed) to support the contention that Himalayan glaciers would melt away by 2035. Changes in climate are affecting many mountain glaciers, with rapid glacier retreat documented in the Himalayas, Greenland, the European Alps, the Andes, Cordillera and East Africa (WWF, 2005). 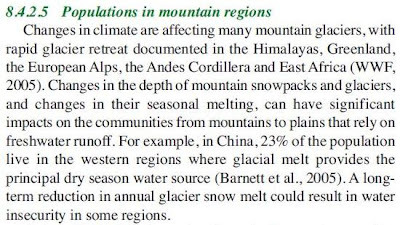 This is the same reference – although the citation style is slightly different - the very same that supported the contention that: "Glaciers in the Himalaya are receding faster than in any other part of the world ... and, if the present rate continues, the likelihood of them disappearing by the year 2035 and perhaps sooner is very high if the Earth keeps warming at the current rate." But what is particularly bizarre about the Chapter 8 reference is that, not only is it "grey", a study of Nepal, India and China is used to support assertions relating to "the Himalayas, Greenland, the European Alps, the Andes, Cordillera and East Africa." It has, however, recently come to our attention that a paragraph in the 938-page Working Group II contribution to the underlying assessment refers to poorly substantiated estimates of rate of recession and date for the disappearance of Himalayan glaciers. In drafting the paragraph in question, the clear and well-established standards of evidence, required by the IPCC procedures, were not applied properly. And claims of rapid glacier retreat "documented in the Himalayas, Greenland, the European Alps, the Andes, Cordillera and East Africa" are not "poorly substantiated" and the "well-established standards of evidence, required by the IPCC procedures" have been followed? One assumes that this must be the case, as Pachauri assures us that there is "only one mistake" and the chances of there being additional mistakes are "minimal". However, Donna Laframboise, a Canadian blogger in Toronto has picked up "dozens" of instances where WWF reports have been cited as the sole authority for contentious claims, including one about coastal developments in Latin America. She lists them all on her site, making Dr Pachauri's confident assertion look just a tad thin. How many "mistakes" will there have to be before Dr Pachauri resigns?